Over the past three days, Microsoft published three explanatory blog posts detailing the People app, the Mail app, and the Calendar app in Windows 8. Each post is predicated by the notion that users will be taking full advantage of the Metro-style interface (as opposed to the standard desktop interface), which uses larger icons and live tiles to relay at-a-glance information for social networking, productivity, and communication software. While the Metro design looks to be tailored for tablet (or touch-screen) use, it's also fully functional with a mouse and keyboard. Probably the biggest takeaway from these app explanations is that Windows 8 features usable, integrative communication software out-of-box, whereas every previous version of Windows has deferred to Outlook (or the defunct Windows Live software) for those functions. It's a direction that smacks of mobile computing hardware, and should excite PC loyalists who haven't jumped on-board the iPad train. An understated, modern approach to contacts, People could be Windows 8's central hub for almost any communication activity. It could also just be a list of contacts. The strength of People lies in its scalability, allowing as little or as much integration as desired. That includes integration with Facebook, Twitter, LinkedIn, and other social networking services. It also includes integration with other apps, like Internet Explorer 10, where sharing and communicating with contacts can be done from a pop-in side menu. This uses the "share contract," a bit of programming that allows individual apps to work inside other apps without having to share code. Because People integrates as many services and options as a tablet into one interface, some difficulty may arise in separating social spheres of influence. Also, anyone installing Windows 8 on a slower PC or a sluggish network will likely suffer from some lengthy load times, as People automatically displays real-time pictures and updates on the Metro desktop and contacts hub. By dropping the Windows Live moniker, Mail for Windows 8 has done itself a real service. Although it boasts additional functionality to the Windows 7 pack-in mail client, the new Mail app performs essentially the same task with a fresh coat of Metro paint. Also integrative with other apps through sidebar menus, Mail distills always-on email communication to what Microsoft sees as the primary functions. This includes sending, replying, and deleting, but doesn't include saving to folders or marking mail as unread, among others. The full functionality is there, but hidden in a couple of pull-up menus for the sake of productivity and aesthetics. Mail supports multiple email accounts, printing from email, and a new snap function that allows a mail menu to show up alongside any other PC activity. For those tech-tethered users that live by their virtual schedule, Calendar on Windows 8 will be as omnipresent as it is simple. Like the other apps, its snap and contract features allow it to show up alongside any other app (desktop included) where it can be updated without loading the full program. Reminders and live tiles round out the suite of calendar integration methods. Inside the app, the priority of "the event" has clearly taken precedence over all else. Customizing the calendar by detail or time-view appears in a clean pop-up menu, and the simplified, "squares everywhere" approach of the Metro aesthetic makes the Calendar as clear-cut as they come. For touch-screen users, wiping to move forward or back in time has been locked to one unit (day, week, month) per swipe, and adding events is initiated by a long-press on any date. 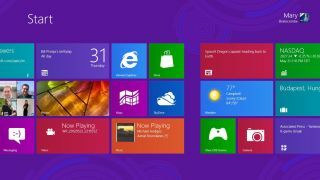 While it may not appear to the detail-oriented computer user, Windows 8 looks like it's removing the clutter that's accumulated over the past five operating systems in favor of access to content. Microsoft is saving that for the desktop interface.